When there’s a New Orleans cause, a fundraiser, a rally or some need for a community to come together, it’s often our clubs, music halls and bars that step in to host. That’s the case with a three-day event that begins tomorrow featuring music acts from across the local spectrum. This example has a twist however: the cause and the venue are one and the same. The “Bring Back Jimmy’s” event is the only listing on the calendar for Jimmy’s Music Club right now. That’s because owner and namesake Jimmy Anselmo is struggling to reopen what had been a legendary Uptown music hall from the late 1970s on. The wrangling is related to City Hall permits and a liquor license moratorium in the club’s immediate vicinity and it’s led to this week’s event, which Anselmo calls a “defense fund concert” to pay for legal bills. After decades running Jimmy’s and booking its stage, Anselmo has a lot of friends in the local music business and many of them are taking part in the Thursday-Friday-Saturday schedule of shows to help him out. It’s shaping up to be a mini-festival with a highly eclectic docket of performers. Some highlights include the J. Monque’D trio, John Autin, Paula and the Pontiacs, Dave Ferrato and Tchoupazine, the Bucktown Allstars and Harry Shearer, of “The Simpsons” and “This Is Spinal Tap” fame, all on Thursday; Cyril Neville with Gaynielle Neville, Paul Sanchez, Kim Carson, Brian Stoltz, J.D. Hill and Jim McCormick all on Friday; and, for a punk-themed Saturday, the Local Skank, Stephie and the Whitesox, the Call Girls, Alexander Fry and Sexdog. See the full line-up here. With a line-up so diverse, you’re bound to know some of these acts well while others may be a surprise. That’s certainly fitting given Jimmy’s history. 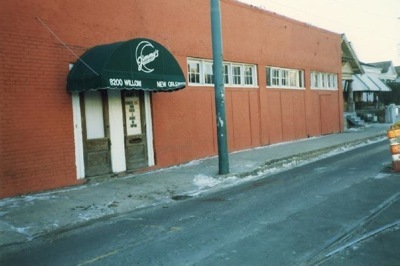 Anselmo started the club in 1978 on Willow Street in a former pool hall. It’s just a low, unremarkable brick building across from the tracks from the Carrollton streetcar barn but it quickly became an important new venue for music in this city, thanks largely to Anselmo’s willingness to book up-and-coming bands, both local and touring, that were developing different sounds. While the Neville Brothers and the Radiators frequently took the Jimmy’s stage, so did punk and new wave bands just then coming up. Over the years, everyone from Professor Longhair and Dr. John to Jane’s Addiction, the Red Hot Chili Peppers and Iggy Pop would play Jimmy’s, adding to the club’s legendary run. More recently, however, the building was the less-than-legendary Frat House, a bar aimed at the college crowd and mimicking the aesthetics of deepest Bourbon Street. The Frat House didn’t last very long, but what has lingered here is a City Hall moratorium on new liquor licenses. Without a liquor license, Anselmo says a club like Jimmy’s can’t be viable. He contends that the moratorium is illegal and, in any case, he argues that Jimmy’s should be grandfathered in (more on the beef here from the Times-Picayune’s Keith Spera). Given the circumstances, this week’s events will be “dry,” (you can order soft drinks at the bar). In the meantime, those who want a drink can just cross the street to Carrollton Station, another bar and music hall that’s undergoing its own rejuvenation these days. Naturally, there’s a Facebook page for “Bring Back Jimmy’s” and an online petition. But in the case of this cause, you can also turn up in person and take in a show, too. Doors open at 5 p.m. each day with shows beginning at 6 p.m. Cover is $15 for Thursday, $15 for Friday and $10 for Saturday.